Apple TV has not been updated in over two years now. Which may be the reason why its competitors has gained some ground. 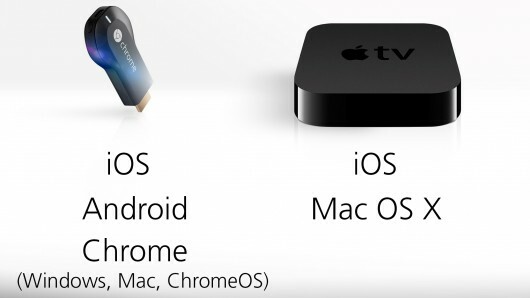 Parks Associates reports that Chromecast is now more popular than the Apple TV. In the first three quarters of the year, streaming media players are at its popularity peak. Almost ten percent of US households bought at least one streaming device this year. According to rumours Apple TV does have an update ready for release but is pending the resolution of negotiation problems with content providers. Google, Amazon and other competitors have taken advantage of the update gap and offer more diverse content at cheaper prices. Google may be the biggest benefactor in the set-top box purchases becoming the second most popular device in households with a broadband connection this year. Last year it was only a minor player in the industry. Roku still ranks at the top but market share has dropped to almost half in the last year from 46% to 29% in 2014. Amazon Fire TV was only announced in April 2014, but is already a serious contender having captured 10% the market.